Security advisor: Is there an ICO standard organisations need to adhere to? 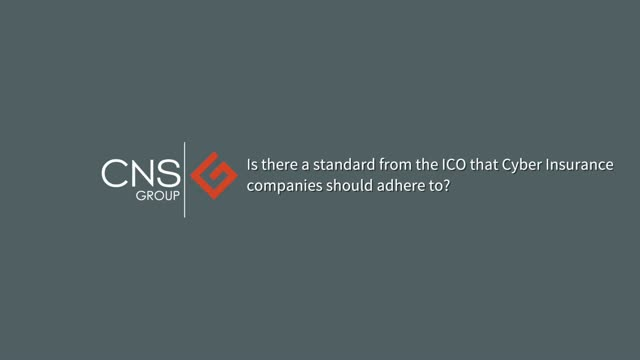 In this fourth panel discussion from CNS Group's Security Chapter event in September, Kevin Dowd, Chairman, CNS Group leads a discussion on whether there is an ICO standard Cyber Insurance companies should be adhering to. Cyber security is not working – budgets increasing only to be outstripped by the number and sophistication of threats and breaches. Organisations need to do things differently – stop just thinking about technology and start thinking about how security works for your business. CNS Group interviews Dr. Sandra Bell, Head of Resilience Consulting, Sungard Availability Services on the integration of CNS Group into the organisation and how CNS's services benefit Sungard AS and it's employees. At The Security Chapter, we interviewed Garreth Cameron, Group Manager, Business and Industry, ICO, on the growing importance of data sovereignty. - Main concern for UK businesses when it comes to data protection? - Why it is important to know where your data is stored? At CNS Group's September Security Chapter event, Garreth Cameron, Group Manager for Business and Industry, ICO, discusses the importance of the ICO breach analysis and what organisations can learn from it. Suring CNS Group's September Security Chapter event, Garreth Cameron, Group Manager, Business and Industry, ICO, discussed the issues around data erasure rights and why, in some cases, organisations may need to hold on to information. A quarter of IT professionals are not confident about their organisation’s security incident response plans. Despite this lack of confidence, respondents were very aware of the impact a breach can have. Join our webinar to find out the top five things you should do when a breach occurs, before calling in the experts. In this third panel discussion from CNS Group's Security Chapter event in September, Kevin Dowd, Chairman, CNS Group leads a discussion on the questions you should be asking your cloud-based services, or security provider. In this second panel discussion from CNS Group's Security Chapter event in September, Kevin Dowd, Chairman, CNS Group leads a discussion over how EU GDPR will impact UK organisations post-Brexit. Shannon Simpson, CEO, CNS Group, discusses why data sovereignty is of increasing concern, especially with the EUGDPR on the horizon. A study by CNS Group found that 92 percent of IT security professionals said it is important to store, access and back up data in the UK. However, only 27 percent were very certain that their data did actually remain in the UK at all times. With Brexit and emerging data protection laws, UK organisations of all sizes will need to know where in the world their data is stored and managed. If comprehensive questions about data sovereignty are not already part of your data governance strategy, they should be. A study by CNS Group found that 92 percent of IT security professionals said it is important to store, access and back up data in the UK. However, only 27 percent were very certain that their data did actually remain in the UK at all times. With Brexit and emerging data protection laws on the horizon, such as the EU General Data Protection Regulation, UK organisations of all sizes will need to know where in the world their data is stored and managed. If comprehensive questions about data sovereignty are not already part of your data governance strategy, they should be. Join our webinar to understand the key questions your organisation needs to answer about data sovereignty. Information Security Officer of a global law firm looks at managing IT in the legal sector. Whether you refer to them as Supervisory Control and Data Acquisition, Industrial Control Systems, Machine Interface, Remote Terminal Unit, Programmable Logic Controller, Internet of Things - these systems underpin many of the manufacturing processes that make modern day life possible from water treatment, steel mills, nuclear power stations, elevator shafts, cars, trains to planes. Yet, when compared with other more common networking protocols, they are often considered “basic”. However the risks and results of compromise are far more grave than other more protected systems. Information Security Manager of a global law firm looks at the benefits CNS Group's Managed Security Services has bought to the organisation. • Who is attacking you and how to recognise different types of attack? As a government accredited company, we help UK organisations of all sizes build cyber security capabilities and maintain compliance through practical consulting and managed services. Our business is securing your data. As a government accredited company, we help UK organisations of all sizes build cyber security capabilities and maintain compliance through practical consulting and managed security services. Title: Security advisor: Is there an ICO standard organisations need to adhere to?